Oh my gosh, oh my gosh, oh my gosh!!! I just made the most delicious chocolate chip cookie dough balls ever!!! Oh and hello! Sometimes I just get soooooooo excited when I make something new, that I can’t wait to share it with you, that I tend to forget my manners and say hi!! How rude can I be? So sorry about that! Ok, now back to cookie dough balls!! Yah, baby I got some rockin balls for you on this Friday! I think this is the best way to end a week! You’ll have to forgive the wetness look to the dough balls. I made them on my birthday and just after I made them, my Husband said let’s go to breakfast, so I put my dough balls in the freezer. I didn’t come home for hours later and when I went to the freezer my little dough balls had slightly froze. Now these balls don’t freeze completely because they are made with cashews and as you may know nuts don’t freeze solid. Oh speaking of my birthday, I want to thank you for the birthday wishes that you left me here and on my Facebook page. Thank you, it meant the world to me. Also for my birthday, my gift from my Husband was a new stove. It’s so pretty and shiny. I won’t get it until the end of August, so when I do get it, I’ll show it to you. Now back to my soft, yummy little balls. 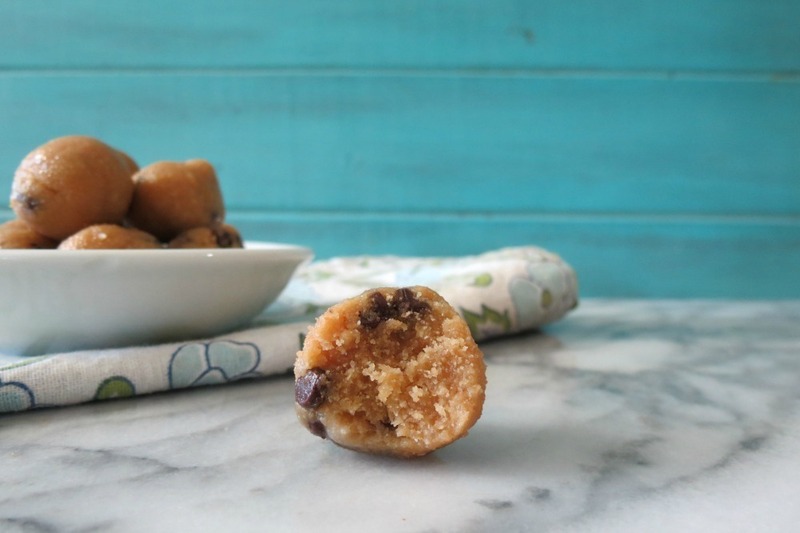 These chocolate chip cookie dough balls are made with cashews, maple syrup, vanilla extract, butter extract and of course chocolate chips. 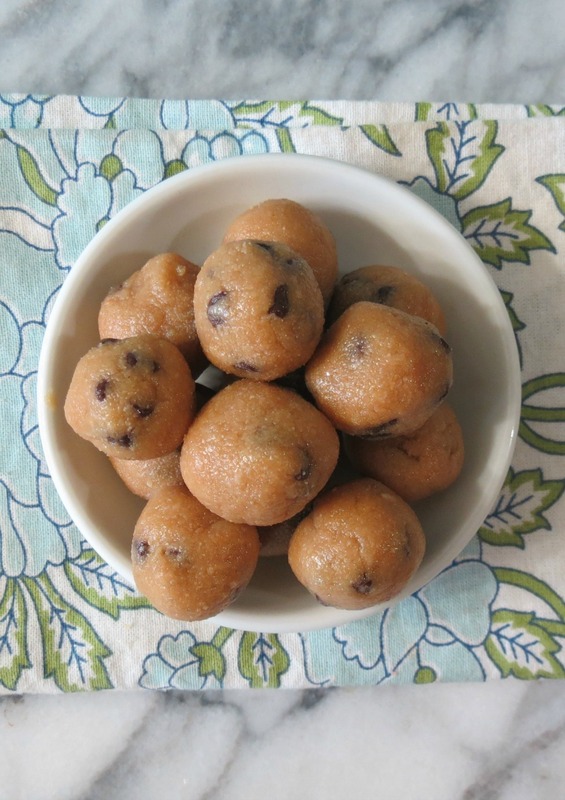 These are the BEST chocolate chips dough balls I have ever made. They are so sweet, soft and taste just like raw chocolate chip cookie dough. Oh my gosh, I have to contain myself not to eat them all. But the good thing about these balls is that they are healthy and guilt-free, unless you eat the whole batch. Try not to eat the whole batch, but trust me, it’s hard. I ate three while photographing them. Then I went for a walk. I needed to work off the sweet little guys, plus all of the other sweets I have eaten the past week. Between birthday cakes, frozen yogurts and balls, I kind of over did it. Plus as you read this, I am on vacation and I can only hope that I control my eating habits while vacationing. I’m afraid to even hop on the scale. At least I am keeping up with my 10,000 steps a day. It’s hard some days, but I am chugging along. So far I only missed two of the days of not making my goals. I love making nut butter in my food processor however, if you don’t have a food processor I know that stores like Whole Foods carries cashew butter. 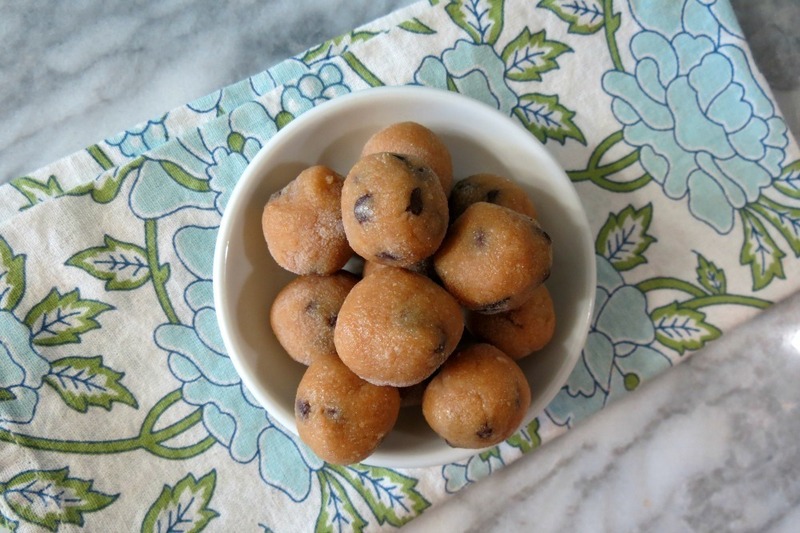 Cashews makes the best sweet treats like these dough balls. My Husbands eyes lights up when I bring a bag of them home and tell him they are not for eating, but for ball making. He just rolls his eyes at me. Also you can make this recipe vegan by using sunspire chocolate chips and you can make it gluten-free by using gluten-free flour. For me I used whole wheat pastry flour. The flour is needed to hold it all together and give it that raw dough taste. 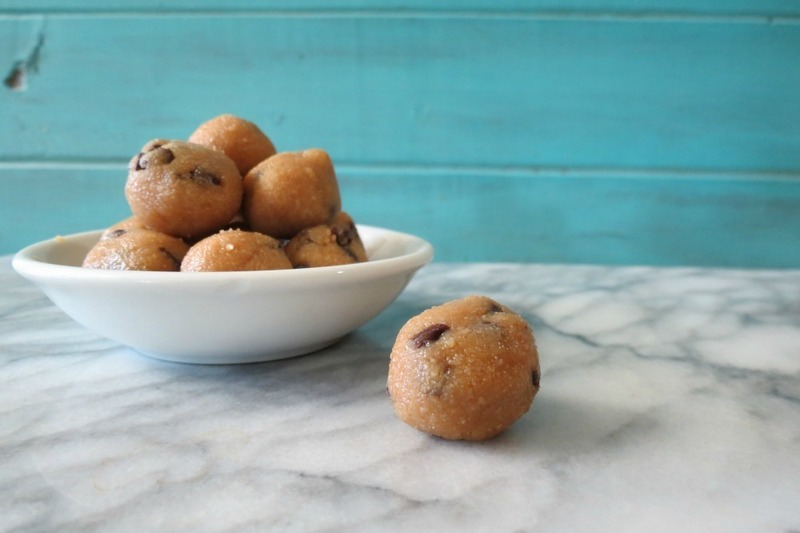 Healthy, good for you dough balls made with cashews, maple syrup and mini chocolate chips that tastes just like chocolate chip cookie dough! In a food processor add cashews and process until the consistency of peanut butter. You may have to scrape down the sides of the bowl a few times. Add maple syrup, stevia, vanilla extract, butter extract and salt. Process until combined. Add cashew mixture to a bowl and stir in flour, until incorporated. Stir in chocolate chips. Roll dough into little balls and place on a parchment lined plate or cookie sheet. Place in the freezer or refrigerator until firm. Once dough is firm place in a freezer safe baggie and store in a freezer for up to 3 months or store in an airtight container in the refrigerator. 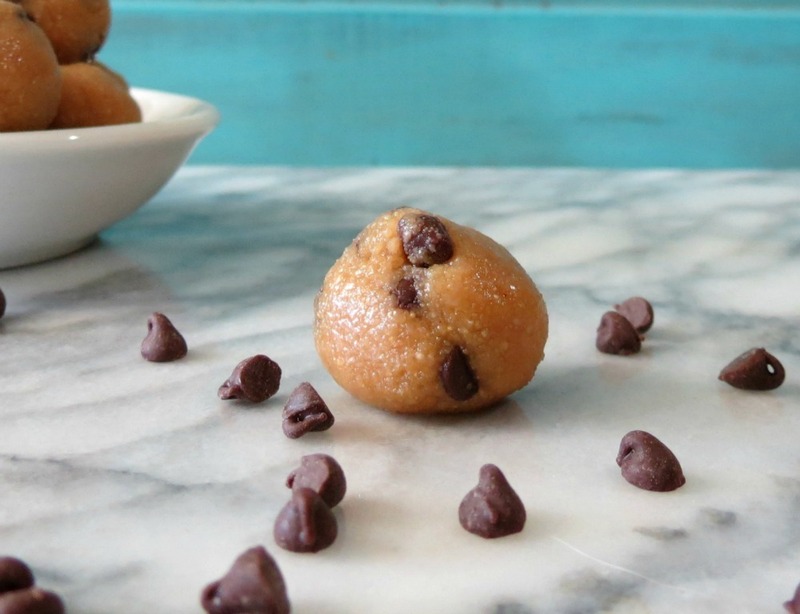 If you love raw cookie dough, you must, must, must make these dough balls. They are so good and so soft! Oh and if you look at the ingredients and you don’t have butter extract, don’t worry, it’s only optional, the dough balls will still be fabulous without it!! Believe me! Well my Friends, since I am writing this in advance, I need to get to more baking and cooking, since I am falling behind on my posts. Have a super great weekend everyone!!! MMMMM!!!! These do look amazing! I love cookie doooough!! I could eat a million of these! They look SO GOOD! Wow these sound great! I tried chickpea cookies, not your recipe, someone elses and did not care for it. But I could get behind this one! And they tell men NOT to give a woman an appliance as a gift… Some of us women must just be too practical. I think a new stove for someone who likes to cook as much as you do, is a wonderful gift! Could you use a regular gluten free flour or does it need to be that “wheat pastry flour”? Would it be bad if I ate the whole bowl?! Yes! These sound amazing! I love cookie dough, but not the threat of Salmonella. These are safe And healthy?? What more can I ask?? These look so yummilicious!!! Would they bake up like a regular cookie if you didn’t want them raw?